Turmeric: A healing remedy. - Doctor Hermann M.D.,P.A. Posted on December 6, 2014 by Reshma Patel, M.D. If this is the first time you’re becoming acquainted with the spice turmeric, it is a beautifully deep yellow, golden or orange color with a taste that is distinctly warm and bitter. It is the spice that gives curry powder its color. Turmeric has been used for thousands of years as a powerful medicinal herb and culinary ingredient in both India and China. The main component that gives turmeric its many health benefits is called curcumin. You may have come across this ingredient in natural health food stores or in various supplements. Turmeric has numerous health benefits. One of the most noted benefits is its anti-inflammatory power. Studies show that long-term inflammation is often the cause of many chronic diseases. Furthermore, numerous studies show that turmeric outperforms many pharmaceuticals in its effects against chronic disease and in protecting the body from disease with virtually no side effects. Turmeric is also a potent antioxidant, neutralizing free radicals in the body that typically damage cells and cause aging. In addition, turmeric has antimicrobial properties that help prevent infection, boost the immune system, and appears to block the division of cancer cells. It has also been shown that turmeric blocks the production of beta-amyloid, the substance that is found in the brains of individuals with Alzheimer’s disease. It is a powerful plant that benefits every system in the body. This is just the beginning of many promising studies that are under way. 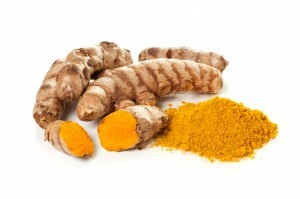 The content of curcumin in turmeric is about 3% by weight, which is not a significant amount. Most research uses extracts of curcumin with dosages exceeding 1 gram. Therefore, it would be difficult to attain this level by using turmeric in the diet alone. However, most people can benefit from this spice by using it in everyday meals to help prevent disease and infection. Those interested in supplementation should look for extracts in dosages of 500mg to 1000mg taken one to two times a day or as directed by the product. Turmeric is quickly metabolized by the gut so to enhance the absorption supplements should be contain black pepper. Piperine, a substance in black pepper enhances the absorption and bioavailability of turmeric in the body. Turmeric is best in raw form but is most widely used in the ground form. You can sprinkle on salads, vegetables, nuts, or add a spoon to your smoothies or juices. A great way to use turmeric is making turmeric tea, especially during the winter months and for the occasional cough. You simply bring 1 to 2 cups of water to a boil and add ¼ to ½ teaspoon of turmeric according to taste. Let the mixture simmer. Mix well and sip away. You can add fresh grated ginger for additional benefits. Like many herbs, turmeric will begin to lose its potency after about six months, so keep your supply fresh. This is a mere glimpse of the abundance of health benefits turmeric provides. The next time you enjoy a curry dish think of all the benefits your body is reaping and remember we truly are what we eat.